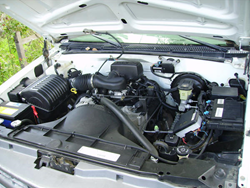 Vortec 5.7L engines have been added to the growing used parts inventory at the Preowned Engines company website at http://preownedengines.com/5-7-chevy-vortec-engine. The full-size sport utility vehicles and pickup trucks produced by General Motors between 1995 and 2009 are a portion of the vehicle brands that will be supported with replacement parts at the PreownedEngines.com company. The addition this month of upgraded replacement Vortec 5.7L engines will provide the public with new buying options at http://preownedengines.com/5-7-chevy-vortec-engine. The 5700 series builds that GM introduced in its larger sized vehicles have earned a reputation for performance. The launch of the TBI fuel injection platform has helped to increase fuel economy in V8 motor blocks. Consumers will have the option to purchase L31 or other small-block 350 units at the POE website. "We have increased our inventory acquisition efforts through GM suppliers in order to revise our 8-cylinder block inventory this year," said one PreownedEngines.com company rep. The used Vortec 5700 builds that are included in the updated inventory will be shipped nationally with additional components protection. Since some of the OEM components have a tendency to fail after installation, consumers buying any of the 5.7-liter builds will benefit from the included warranty package. "Almost all of the RPO codes for V8 builds in our inventory will receive support through the new warranty plans we are providing with every order," said the rep. The Preowned Engines company is now supplying a method for consumers to receive support by phone through its service center. A person who needs instant help can call 1-866-320-1065 in the U.S. and can speak at length with a trained engine expert. The PreownedEngines.com company features a large inventory of replacement vehicle motors that can be quoted in price or purchased in real time through the company portal. The company has recently acquired diesel powered blocks that are discounted from suppliers nationally. The PreownedEngines.com website is now offering a simpler contact solution for consumers.